Please note that this is not necessarily an exhaustive list! Any private lines (e.g. pool-related lines) will not be covered by these services, and it’s possible that there are other exceptions. Please do your own research. Please note that these are simply here to point out where to start looking at regulations. There may be other relevant regulations, and these were only current as of November 6th, 2013. We’re not sure if they apply to you, we don’t know if they’re correct, we don’t have any further information; caveat lector (“reader beware!”), as they say! If you have any doubts about them, please contact the City of Kitchener’s Information Officer or Zoning Office. The following are the definitions under Chapter 842 of the municipal code. They can be found online at kitchener.ca. 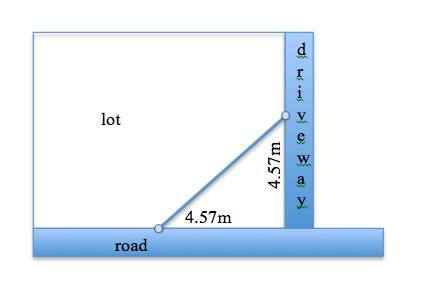 Basically it is a triangle formed by the sidewalk and driveway 15 ft by 15 ft.
“driveway visibility triangle” means a triangular area formed within a lot by the intersection of a driveway line and a highway line or the projections thereof and a straight line connecting them 4.57metres from their point of intersection. Area where you should *not* put your little library, if you live in the City of Kitchener. The English was a bit hard to parse, but Toby confirmed that my diagram [above] is a correct interpretation. So, basically, you can’t place your library in the triangle formed by the driveway, road, and the diagonal line connecting them that starts 4.57m out. Thanks for looking into this, Caroline!